Plus Metro asks: are Metro's passenger information displays more annoying than informative? The Plus Metro blog takes a look at Metro’s high tech passenger information monitors that are found in Red and Purple Line stations and notes that while cool, the monitors exhibit a bunch of problems that need to be addressed. 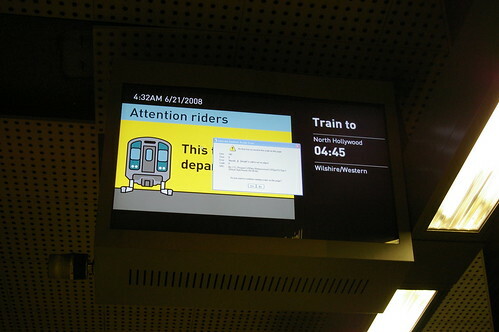 Those problems include glitches that make the train departure times disappear from the display and self-promotional advertisements that fill the screen and deprive passengers of more relevant information for up to 30 seconds. As a regular subway rider, I can confirm that these issues can be a major annoyance. The Huffington Post has an informative slide show with maps of some major high-speed rail projects currently in the works in the United States and abroad. California’s high-speed rail ambitions are mentioned first, likely because our state received the largest chunk of federal money ($2.25 billion) allocated for high-speed rail projects across the nation. China’s plans make California’s $2.25 billion look like chump change. The country’s $300-billion 16,000-mile high-speed network expansion is set to be complete in 2020. In more high-speed rail news, the New York Times wonders if Florida’s plans for high-speed rail will pay off. The state was given $1.25 million in federal stimulus money for its high speed rail project connecting Orlando to Tampa. Driving the route typically takes about 90 minutes and the train ride is expected to shave only about half an hour off that time thanks to five stops along the way. A larger problem is the fact that both Orlando and Tampa are sprawling new American cities with very limited public transit infrastructure – something I can attest to having grown up in the Orlando area. What this means is that once train passengers arrive to their destination city there’s currently no practical way – other than renting a car – to move around those cities.